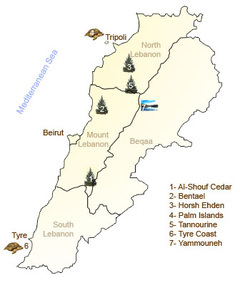 Lebanon is located on the eastern Mediterranean coast at 33°00'N latitude and 35°50'E longitude. The name Lebanon (also "Loubnan" or "Lebnan") is derived from the Aramaic word laban, meaning "white", a reference to the snow-capped Mount Lebanon. The size of the country is 10,452 sq kilometers ( 4,042 sq miles). The width of the country varies from 40 to 89 km (25-55 miles). Mountainous country; highest peak, Qornet el-Sawda, 3,088 m. (10,131 ft ).